GIR has published the third edition of its practical guide for external and in-house counsel, compliance officers and accounting practitioners. Chapters are authored by leading practitioners from around the world and made available to GIR’s readers free to view and download. Indexed and with comprehensive cross-referencing, this two-volume hardback features tables of cases and legislation and is available in our shop or as part of a GIR subscription. In this edition, we have added a chapter on data protection for Volume I, and we have expanded the scope and number of data protection questions in Volume II. The publication also reflects the Court of Appeal’s clarification of English law on legal privilege in the ENRC case, and the US Department of Justice’s adoption of the Corporate Enforcement Policy as part of its FCPA enhanced enforcement programme. In addition, Volume II now covers 21 jurisdictions, including Australia, Canada and Mexico. Want to write for GIR? 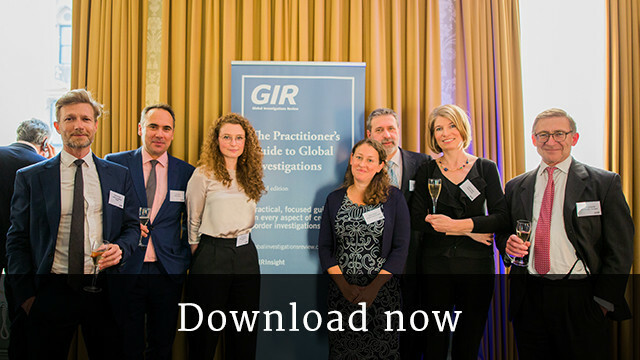 "Global Investigations Review's The Practitioner's Guide to Global Investigations is the most comprehensive publication currently on the market in relation to cross-border, multifaceted corporate investigations. It does what it says on the tin - ‘How does one conduct such an investigation? And what does one have in mind at various times?' - and it does it rather well." Tapan Debnath, Legal Counsel, Nokia.